As explained in chapter Acoustic principles the construction of the neck has to guarantee that under string load the neck deflection will be practically zero. From the standpoint of a design that is based on a connection between nut and saddle firm as a rock the design of the neck itself is relatively simple. If you follow the usual instructions in guitar construction manuals you will end up with a neck that can withstand the pulling forces of the strings without any problem. For an impression of actual deflection it is interesting to look in the appropriate spreadsheets in "Left-Brain-Lutherie" (ref. 15). For a more or less standard classical guitar neck (mahogany with an ebony fret board) the deflection, measured in change in the action at the 12th fret is about 0.1 mm, which is no problem to deal with during the construction. For the EB-guitars this deflection is even less than 0.05 mm. The choice of the wood and careful construction of the neck and its connections with foot, heel and fret board has to prevent dimensional changes with time. But that is more of a constructional challenge than a design problem. In general, the width and thickness of the neck and fingerboard are chosen in view of the playability of the guitar. From that point of view it is interesting to know how some famous luthiers chose these dimensions. In his book "Making Master guitars" (ref. 21) Roy Courtnall gives detailed information on the dimensions of 8 classical guitars, constructed by internationally famous guitar makers. Taken from that reference some dimensions related to the neck and fingerboard are given below (measurements in mm). The position of the neck in relation to the guitar body is a more complicated story! There are many variables that are related to the body-neck angle. 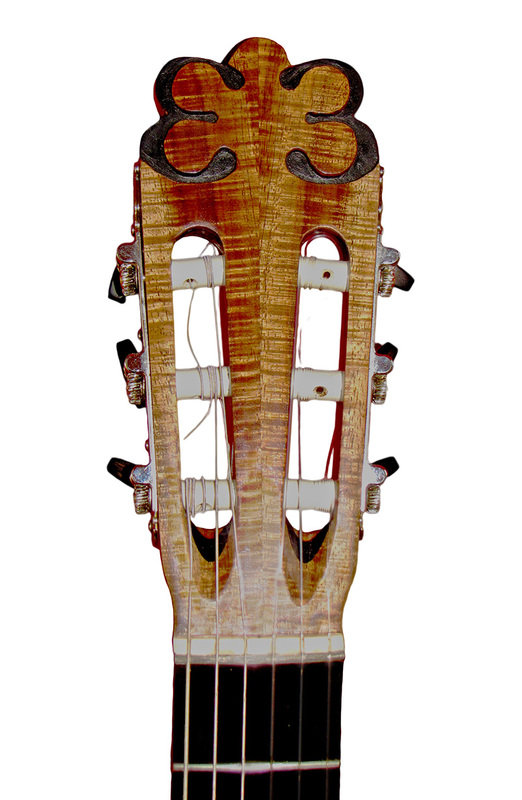 The image Position of neck and guitar body gives a schematic drawing of these variables. Based on a standard thickness of an unshaped fret board we choose fb0 = 5.5/7.0/5.5 mm. In these formulas we can see the relationship between the height of the saddle, the thickness of the fret board, the dome and the body-neck angle of the soundboard. Some possible combinations are shown in the image below. Be aware that the above image gives an example of the middle of the fret board and saddle. Based on the assumptions for the fret board and the different actions for the strings the height of the saddle for the E-high string is 2.5 mm lower than for the G/D strings. The saddle height for the E-low string is 0.5 mm lower than for the G/D strings. Some constraints in the choice of these combinations have to be mentioned. The dome of the top should be within limits. E.g. not less than 2 mm and not more than 5 mm (see chapter The soundboard). When we choose in image Choice of the dome and height of the saddle for a thickness of the fret board of 5.5 mm (at the G/D position! ), we have to realize that at the E string positions the thickness of the fret board at the 12th fret is only 4 mm and at the 6th fret even less. This is about the minimum I allow in view of the role of the fret board in strengthening the neck. 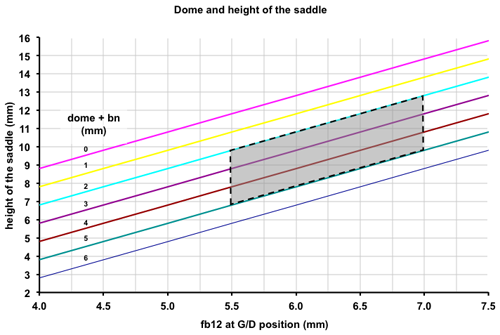 With these constraints in our mind we may choose our combination of dome and saddle height within the shaded area indicated in image Choice of the dome and height of the saddle. For the EB-guitars with a dome of 2 mm, no body-neck angle and a fb12 of 5.5/7.0/5.5 mm we end up with a saddle height of 10.3/12.2/12.8/12.8/12.6/12.3 mm.